I retired from Goodway Technologies Corporation July 1, 1997. On June 26 Goodway presented me with a retirement lunch and a retirement dinner. From the gifts I think they view me with two interests - corkscrews and fishing! In addition to receiving an Old Town Canoe and fishing equipment galore, there were corkscrews! 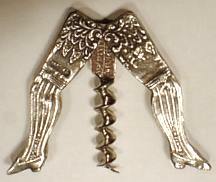 Per Reichborn, my business partner, has collected corkscrews for several years. I have always admired his Can Can legs corkscrew and try as I might, I could never talk him out of it. Per very generously presented that very corkscrew to me at my Retirement Luncheon. The top of the worm is marked REGISTERED GERMANY. The silver scales are marked STERLING. They are the "mini" size legs measuring 1 7/8" long. A couple of weeks before my retirement, our advertising manager came in my office and took photos of my head from all sides including the bald top. The Engineering Department presented me with this wood carved bust with secret pedestal compartment. In the compartment is a unique Goodway engineered bull head corkscrew! The plaque is inscribed "Appreciatively Presented to Donald A. Bull, President of Goodway Technologies 1971-1997. 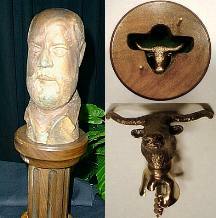 For grabbing the Bull by the Head and providing the impetus for Goodway's success. We Wish You: Good Health, Success in your Future Endeavors and Flavorful Wine From your Friends." Gary Heitzenroder from Pittsburgh has sold products for me for many years. He was the first to call me BULLMAN and annually he sends a birthday cake complete with frosted Bull Head and greetings to the Bullman. His wife Sue is a super artist and has presented this wonderful watercolor to me. 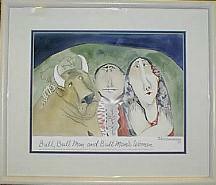 It says "Bull, Bull Man and Bull Man's Woman. My digital photo doesn't do it justice but if you look real closely you will see that Bullman has a corkscrew in his right hand. No retirement party for the Bullman would be complete if Bernie wasn't there. 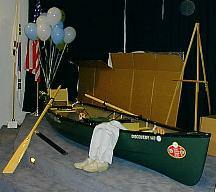 Here's a shot of Bernie relaxing in the Canoe gift. He's ready to go fishing with me anytime! ...and...on the occasion of my 25th year with Goodway (July 1996), I was given a portrait sitting. The portrait was completed January 20, 1998.